Throughout my research and discussions with multiple literacy teachers about early intervention strategies for struggling readers I discovered the Orton-GIllingham approach. Ana Vieiraa explained to me that this approach can be extremely effective with particular students who aren’t quite getting it in class. According to https://www.ortonacademy.org/resources/what-is-the-orton-gillingham-approach/ The Orton-Gillingham approach is intended primarily for use with individuals who have difficulty with reading, spelling, and writing of the sort associated with dyslexia. It is most properly understood and practiced as an approach, not a method, program, system or technique. In the hands of a well-trained and experienced instructor, it is a powerful tool of exceptional breadth, depth, and flexibility. On the website they discuss how they developed the approach, they said that part of it was through practice and lots of knowledge that was validated over the past 70 years and the other part was created from scientific evidence about how individuals learn to read and write, why a significant number have difficulty in doing so; how having dyslexia makes achieving literacy skills more difficult; and which instructional practices are best suited for teaching such individuals to read and write. This early intervention approach is more difficult to implement in your classroom because it is usually a one-on-one/small group teacher student instructional model. But it has been adapted to be valuable in classroom instruction.The main focus is it to help students with their reading, spelling and writing difficulties. It is extremely student-centered as it is developed around the learning needs of the individual student. Throughout our careers it is very likely that we will all have dyslexic students in our classrooms so it is important that we take the time to learn how to help them effectively. Students with dyslexia require more help understanding the basics of language and the writing system. This is because sorting, recognizing and, organizing language does not process as easily for them as it would for a student without dyslexia. In order to practice this approach in your classroom you are required to get training and a certification. I think that this is a very effective strategy and I am very interested in getting certified myself in order to help students in my class with dyslexicia or for other learners who are struggling with literacy in my classroom. Unfortunately I am unable to go into depth about how this approach works but if I get more information from a teacher who is certified I will definitely add the information to my blog post. If you are interested in getting certified I attached the website link at the beginning of my second paragraph. I also attached this video of the Orton-Gillingham approach in action if you are interested in getting an idea of how it works. I hope this helped to inform you about one more early intervention approach that is accessible to you in order to support readers in your classroom who are struggling. The more I learned about this program the more I realized how applicable it was to my inquiry question. This strategy can be used throughout all grades in elementary schools. It is beneficial to all readers but it is indeed a early intervention strategy for struggling readers as well because it provides teachers with the time and structure to meet diverse student needs. Overall, I think the Daily 5 is a very effective program that supports all learners needs and is just one more early intervention strategy. If you are interested about learning more about this program I have attached the link to the programs official site under my first paragraph where I describe what it is. Below I have attached a video that showcases how a classroom teacher has implemented the Daily 5 in her own classroom. Early Intervention is extremely important as we all know, yet often times students who are struggling to read find themselves falling further behind each year. Carol Lyons from “Catching Readers Before They Fall” discusses the brain research on children and the evidence suggests that the earlier they are given help the faster they will learn in order to catch up to grade level. Marie Clay from “Catching Readers Before They Fall” developed a program called Reading Recovery as a early intervention program. The purpose of this particular program is for teachers to focus and work with the lowest 20% of students in their first grade. The program requires a thirty minute lesson once a day to individual children. The success rate for this program is 75% in just 12-20 weeks. This program has been extremely successful because thousands of teachers have bought into it. In the book they note that this includes students who have IEP’s. Reading recovery focuses more on teachers learning a new way of thinking about reading, a way of understanding the reading process. As opposed to main focus being on developing the specific thirty minute lesson each day. In the text book “Catching Readers Before They Fall” they outline several things that a Reading Recovery teacher knows or does well. The outline is also beneficial for any teacher with struggling readers. Provide many opportunities for the student to demonstrate authentic reading/writing opportunities. This helps strengthen their processing ability because they are constantly using their systems of strategies. To sum up this particular early intervention program I thought I would show this video on Reading Recovery as it is gives a very quick yet informative recap of what it is and how it works. This program was developed many years ago now so for my next post I will focus on a more current early intervention strategy for struggling readers. Why aren’t all students successful readers? Over the past few weeks I have researched my inquiry question on “Early intervention strategies to allow all students to have the ability to be successful in order to develop a love of reading.” Throughout my inquiry I will be using the book “Catching Readers Before They Fall” by Pat Johnson and Katie Keier to guide my research along with multiple other resources. In order to dive deeper into this topic it is important that we have an understanding of Why aren’t all students successful readers? According to “Catching Readers Before They Fall” part of the problem is twofold. Struggling readers are not applying a reading process system in their minds to make meaning of what they are learning in other words they have not learned how to fix errors or even recognize when they have made one. Many teachers have not had the opportunity to understand how reading works, which is how a students creates a reading process system in their own minds. This topic is controversial because oftentimes teachers believe that if MOST of their students are learning to read then they must have developed a successful reading program. Although through my research it is hard to be satisfied with most of our student’s when 20% are struggling. These students need us as educators to understand how to help them build an effective reading process system. We have the opportunity to do this by educating ourselves about the reading process and how to support children as they construct a network of strategies. Often times the problem is these students don’t realize that they have the ability to use different strategies to solve their own errors. What is a reading process system? you may ask.. When we are reading we are constantly using strategies to make meaning of the text we may visualize what is happening at the same time as inferring about what the character is thinking or feeling. Several processes work together in cohesion to guide us as readers through a story or text. 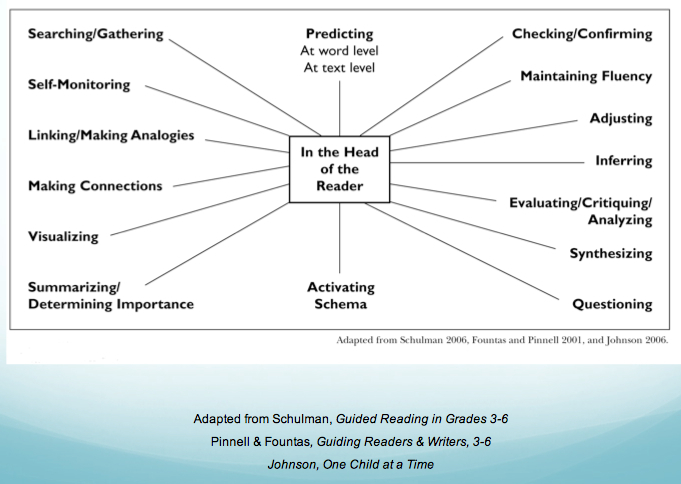 Below is a picture from “Catching Readers Before They Fall” that shows one way to describe the array of strategies that are essential for reading. For my next blog post I will be focusing on early intervention for struggling readers and how to apply it in your classroom. I want to better understand how to teach reading especially to students who are struggling. I want to know how to catch readers before they fall so they don’t lose confidence or the joy in reading. I want to be able to know what steps need to be taken to best support the learner I am working with. I also want to learn how I can best support each reader individually while still being present for the rest of the class. Another area that interests me is how do you promote the love of reading to a reader who is struggling. How can the process be made enjoyable?